The Safari web browser has always included an ability to delete all web history, site data, searches, and cookies on a Mac, but the latest versions of Safari for Mac OS make this task even easier and offer a bit more control with four possible options, allowing users to perform removal of web browsing history at multiple levels, including any of the following; remove website data from only the prior hour of browsing, delete website history data from today, delete browser data from today and yesterday, or, go all out and remove all data from all time periods. This article will show you how to clear web history in Safari on the Mac. Clearing Safari history is an incredibly useful feature for when you want to cover your web browsing tracks in Safari for whatever reason. Whether it’s because you were shopping for a surprise on a shared computer and don’t want someone to see that, you were visiting a particular online store, you want to remove a saved login from a web site, or because you were browsing a website or two that you just don’t want to show up in your history in general. Whatever the reason, clearing out that history is simple. The change is immediate, history will be cleared instantly and as requested. There is no need to relaunch or re-open Safari on the Mac. You’ll find there’s a note mentioning that “History will be cleared from devices signed into your iCloud account”, meaning this will transfer over to other modern Macs and iOS devices that are logged into the same Apple ID and using a new version of Safari. As a result, this can be used to remotely clear cache and web history from a remote computer, which is a nice additional usage of this feature. As always, you can directly remove the same data in iOS Safari too. While this works just fine to clear out web history and data for specific websites after you’ve visited them, if you’re aiming for privacy, a better solution is to prevent that sort of web data from being stored entirely. That’s basically what using Privacy Browsing mode in Safari on the Mac is for, which, when enabled, automatically prevents any site history, caches, cookies, or data from being stored beyond that particular session. Close a window, and that’s it, no footprint is left behind. Private Browsing is also easy to use, and offers a great way to discretely browse the web on any Mac or iOS device. Of course, there are many valid reasons to clear website data beyond just privacy, and often resetting the Safari browser will resolve various problems that are encountered with the browser too. 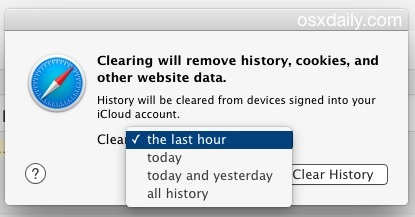 This capability of clearing different levels and dates of web history from Safari is somewhat modern to Mac OS, and much earlier versions of Safari in earlier Mac OS X releases do not have the same precision. So DONGLONG, I got the solution for you! Here’s the deal, you have this little icon on your Dock it looks like a post office stamp, ok? That’s called “Mail” if you click on that (with your mouse, the mouse uses the CURSOR on the SCREEN of your COMPUTER) you will open your Yosemite Mail app. OK LongyDongy? I hope that assists you in opening your email. Good luck my buddy, let me know if you need anything else, I am here for you! This one is free, but from here on out I will charge $250 per call for phone technical support if you need further assistance, you just let me know, Mr Ron Jay is here for you! Want my number buddy? I can see my name really got you excited, RJ. Sorry, but I don’t swing your way. Feel free to forward my $500.00 proof reading fee of your post to my email account. Hey that’s handy, I like that, I like this idea better than deleting everything (unless, you know, you really went wild for an evening and have a 4 hour history of some of those real special websites). Anyway, I really don’t want some particular things in my history, so Ron Jay deletes that stuff right away from Safari, but usually I will use Incognito / Privacy. This is a miles better way, thanks. What a useful comment applestocrapples, you’re really contributing something to this discussion and will be greatly missed I’m certain! It’s a shame all the options include “now”; I’d prefer to clear built up crap from yesterday and beyond while keeping today’s items. If anyone could find how to clear history withouth clearing cookies and other datas on Safari 8, that I would call an incredible useful feature. Deleting it manually won’t do the trick. Deleting History.plist doesn’t work either. It’s a pity though, they removed the “Reset” function from Safari. The one you refer to at the end of your message?!!!!! HOW ABOUT THE HARD DRIVE. DOES IT CLEAR THAT TOO? It removes recent web browsing history files from the Safari web browser located on your hard drive, I think that is pretty clearly stated in the article, SIR WILLIAM EVANS. PS: Hitting the Caps Lock button will make your type normal casing. Delete history from iPad and iCloid will sync that to your MAC, without removing your login cookies. There is a shortcut key here for removing browsing history of Safari. Command+Comma >> Privacy >> Remove All Website Data >> Remove Now. To delete Safari history, the combination of Shift+Command+Delete can be used and in case of deleting Chrome history, I use Ctrl+Shift+Delete and click on Clear History button. I have a site that I go to for work and after I access it and navigate away, I always have to clear my history before I can access the site again. Does anyone know why this is or how I can work around it? It is annoying! I share the mac with others. If I reset my safari browser, will it also reset the safari browser of the others who share the computer? I do not want to remove their favorites, etc. Ok. So i’ve updated my Mac to OS X El Capitan and since then, i’m having some problems with it. For instance, when i clear the history (i use Safari), i’m automatically disconnected from all sites and all data, erased. I have to constantly connect on every single site, just to be disconnected a few hours later. It’s sooooo annoying!! Does anyone know how can i stop this thing from signing me out from everywhere? ?